Paul Sherwen (7 June 1956 – 2 December 2018) was an English professional racing cyclist and later a broadcaster on cycling, notably the Tour de France. He raced in seven editions of the Tour, finishing five, and gained a reputation for his ability to suffer over long mountain stages. Born on 7 June 1956 in Widnes, Lancashire, Sherwen was brought up in Kenya, where his father ran a factory which produced fertiliser, paint and insecticides. He started his sporting life as a swimmer, finishing second in the under-14 Kenyan swimming championship. Upon returning to Britain, he won the regional under-18 championship for Runcorn and District. However, at 16, he turned to cycling and rode for the Weaver Valley CC in Cheshire, receiving guidance from Manchester coach Harold Nelson, and trained regularly with other local riders destined for professional careers, notably Graham Jones, John Herety and Ian Binder. At 19, riding for Altrincham Road Club, he won the season-long Star Trophy series in 1976, winning the Manx International and the Archer Pernod GP and two stages in the Tour of Malago. A year later, he won Folkestone-London, attacking from the gun. For the French team ACBB (Athletic Club Boulogne Billancourt) he won Paris-Barentin, Paris-Mauberge and the Tour de l'Essone, was third in the amateur Paris–Roubaix and second in the British championship. He won the Archer Grand Prix cycle race in 1976 and 1977. Despite spending only part of the year in France due to examinations, he came second in the season-long Palme d'Or competition. 1977 saw him ride the world championship in Venezuela, the pro-am Étoile des Éspoirs and the Scottish Milk Race. Upon leaving ACBB he was invited to nominate a rider as his successor at the club, becoming the first of a chain of English-speaking riders who graduated to the highest level of the sport via the club, including Irishman Stephen Roche, fellow Britons Robert Millar (now known as Philippa York) and Sean Yates, and Australian Phil Anderson. He then turned professional in 1978 for Fiat under Raphaël Géminiani, and later rode as a domestique in the La Redoute cycling team. He finished 70th in the 1978 Tour de France. In 1980, he came close to being eliminated on the third stage of the Tour. He finished outside the cut-off time (a percentage of the winner’s time), but was reinstated in view of his solo chase after a crash. The reinstatement delayed abandonment, and he was to repeat the process six years later. Sherwen was 19th and 11th in Milan–San Remo in 1979 and 1980 respectively, and 15th in the 1984 Paris–Roubaix. He finished third in the Tour du Haut Var, won by Sean Kelly, in 1982, following a stage win in the season-opening Tour of the Mediterranean. He came second in the Four Days of Dunkirk in 1983, winning a stage. He won the Grand Prix de Denain. In the Tour, Sherwen finished 111th in 1982 and 116th in 1984. During the last mountain stage of 1984, he diced with the cut-off time. Riding with Australian cyclist Allan Peiper towards the summit at La Plagne, Peiper was knocked from his bike by a Dutch enthusiast. Sherwen – aware of the cut-off – told him to get back on his bike and they crossed the line just inside the limit. On the first day in the mountains of the 1985 Tour de France, Sherwen crashed in the first kilometre before the race had left Épinal. With Bernard Hinault setting a fast pace, Sherwen had little chance to regain the other riders. He rode solo for six hours over six mountains, accompanied by a motorcycle outrider, and was over an hour behind the stage winner, and 23 minutes outside the cut-off – the Tour publicity caravan had started its return journey and had to move to one side to allow Sherwen to complete the stage. However, again, his courage and endurance were rewarded by reinstatement – he was able to continue and went on to finish this Tour which would be his last. Sherwen joined Raleigh in 1986 alongside Mark Bell, Paul Watson, Jon Clay and Jeff Williams. He retired after two seasons winning the British road race championship in 1987 his final season. He then managed the Banana-Raleigh team until Raleigh pulled out at the end of 1989. 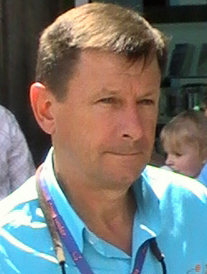 During this time, he worked as a co-commentator with Phil Liggett for Channel 4's coverage of the Tour de France, with the pair making their debut together on the Tour in 1986. After Banana-Raleigh, Sherwen worked as the Public Relations Director for the American Motorola Cycling Team. He was also considered for the position of Performance Director at British Cycling in 1997, but lost out to Peter Keen. Up until the conclusion of the 2016 Tour de France, Sherwen provided the commentary broadcast internationally for many television networks including Australia's SBS Network and the United States' NBC Sports with Phil Liggett. Sherwen lived in Kampala, Uganda: he had interests in a gold mine in Busitema, and commuted between Uganda and the United States regularly. Sherwen and Liggett then commentated for NBC Sports only. Sherwen died of heart failure on 2 December 2018 at his home in Kampala, Uganda, at the age of 62. He was survived by his wife Katherine and their two children Margaux and Alexander. ^ a b c d e f Fotheringham, William (10 December 2018). "Paul Sherwen obituary". theguardian.com. Retrieved 26 December 2018. ^ a b Pender, Kieran (2018-12-03). "A cult figure, Paul Sherwen brought cycling to the world". the Guardian. Retrieved 2018-12-04. ^ "Paul Sherwen Profile". cyclebase.nl. ^ "Paul Sherwen Profile". cyclingwebsite.net. Archived from the original on 1 August 2008. ^ a b Abt, Samuel (2018-12-03). "Commentary: Remembering Paul Sherwen". VeloNews.com. Retrieved 2018-12-04. ^ "Paul Sherwen, cycling broadcaster and former rider, dies aged 62". the Guardian. 2018-12-02. Retrieved 2018-12-04. ^ Abt, Samuel (1995-07-20). "Race Ignored, Procession Honors Rider". The New York Times. Retrieved 2014-07-14. ^ "It's a new era for SBS and the Tour de France". sbs.com.au. Special Broadcasting Service. Retrieved 1 July 2017. ^ "SBS makes changes to Tour de France coverage". news.com.au. news.com.au. Retrieved 1 July 2017. ^ Interview with Paul Sherwen, Cycling Weekly, 15 April 2008. ^ "Iconic voice of cycling Paul Sherwen dies at 62-years-old - Canadian Cycling Magazine". Canadian Cycling Magazine. 2 December 2018. Retrieved 3 December 2018. ^ MacMichael, Simon (2 December 2018). "Paul Sherwen has died, aged 62". Road.CC. Retrieved 2 December 2018. ^ Weekly, Cycling (3 December 2018). "Tributes from Phil Liggett, David Millar and more as cycling broadcaster Paul Sherwen dies at 62". Cycling Weekly.